Rankings season was kind to Cornell once again, but with a new wrinkle this year: both the theatre and art departments were recognized as among the nation’s best. The theatre department was ranked 16th in the country by The Princeton Review’s “The Best 371 Colleges.” Though The Princeton Review does not explicitly rank colleges, Cornell was included among the best list, which accounts for roughly the top 15 percent of four-year colleges in the United States and Canada. Art was also cited for its excellence, this time by The Fiske Guide to Colleges. The art department was recognized by Fiske as one of the top among small colleges and universities. Cornell was one of only 24 art and design departments to make the list. Cornell was also cited as a “Top Financial Find” and one of the “44 Best Buy Schools” in the 2010 edition. 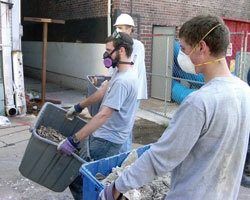 Cornell students have logged thousands of hours helping clean and repair areas damaged by the 2008 floods. Chair of the Cornell Board of Trustees John Smith ’71 and his wife Dyan are at the forefront of Block by Block, a program aimed squarely at speeding up neighborhood recovery in flood-damaged areas of the Cedar Valley. The heavy lifting on the $1.9 million is being done by the Smiths, who are contributing $1 million to the effort that came about when the couple approached another community leader about doing more to hasten the recovery. 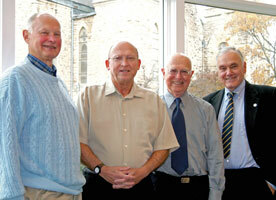 Although this Block program is not affiliated with Cornell, the program has Methodist ties. It was largely founded by The Rev. Clint Twedt-Ball, a Methodist minister. Eric Weston ’78, a former Cornellian and Royal Purple photographer, has posted an extensive collection of images of Cornell student and academic life from 1974–’78. Weston documented campus life throughout his four years on the Hilltop and edited the ’76 and ’78 Royal Purple. Mount Vernon is called a lot of things. Charming, quaint, welcoming. And now, Mount Vernon is also officially “cool.” Arthur Frommer’s Budget Travel named Mount Vernon one of America’s Coolest Small Towns for its art, culture, and food. The magazine complimented Mount Vernon’s artistic community, cited the Chalk the Walk festival, called Fuel “the unofficial clubhouse for Mount Vernon’s creative types,” and, of course, pointed out the nationally known Lincoln Café. Photos for the article were taken by Cornell art professor Sandy Dyas. 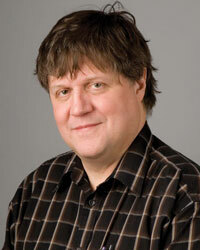 Cornell Professor of Mathematics Jim Freeman had the number of a Cedar Rapids Gazette story. All nine of them. Wednesday, July 8, was a unique day, mathematically speaking, when the time/date combination of 12:34:56 7/8/09 came up. Some were saying this phenomenon would never happen again, but Freeman knew better. “It definitely will occur again, if we don’t blow ourselves up,” but not for another 100 years, Freeman was quoted as saying. As long as only the last two digits of the year are used, this phenomenon will occur again in 2109, 2209, and so on. As if there weren’t enough coincidences in play, the story was written by Erin McNeill ’10, former co-editor-in-chief of The Cornellian and Gazette summer intern. 2009 marks the first time in Cornell’s long history that there are four active faculty/administrators each with more than 40 years of service: Professor of Chemistry Addison Ault (1962), Professor of Politics Rob Sutherland (1968), Professor of German Charles Connell (1968), and Professor of Philosophy Paul Gray (1969). The next in line to join the 40 and over club? 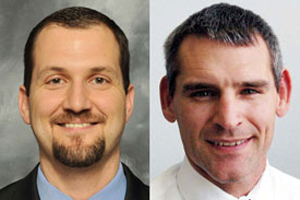 Professor of Art Doug Hanson in 2011, Professor of Politics Craig Allin in 2012, and Professor of Spanish Sally Farrington-Clute in 2013. 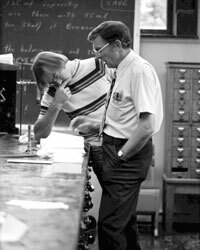 The only other faculty member to hit 40 years in recent history was Professor of English Robert Dana, who had served 40 years at the time of his retirement in 1994. 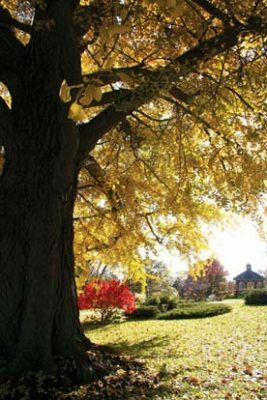 The magnificent tree to the east of the President’s House is a male ginkgo certified by the Iowa Conservation Commission as the largest reported of its species growing in Iowa. It is believed to have been planted in the early 1850s and likely came by clipper ship from the orient, then across land by railroad and oxen-pulled wagon.